I love the look of topiaries on a mantle. You can use them year-round and doll them up for the holiday season. The only thing about purchasing one from a department store is that they tend to be very pricey and many times they are cheaply constructed. With that in mind I decided to try to make one on my own. I have to say that I am liking the result! 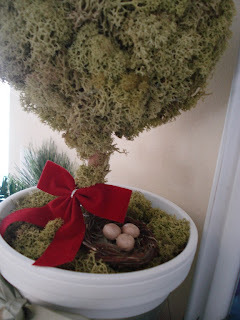 I made mine using Norwegian reindeer moss. I love the lighter green color and the texture of this moss. It has a soft feel to it too! 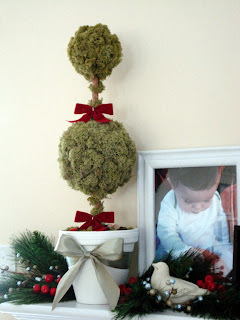 You can also use Spanish moss to get a different look but it has a crunchier texture than the reindeer moss. The only thing about working with reindeer moss is that it stinks when you first take it out of the bag due to the preservatives. Also, you have to spend a lot of time picking out dirt, sticks, and dead pieces of moss. It is a bit tedious and very messy but it's worth the time. Now, I just need another one for the other end of my mantle. Maybe I'll get it done in time for next Christmas! Very cute, Hana! Way to go. Martha Stewart would be proud! David had to hang our stockings above the front door frame, so I guess people will have to come through the side door till Christmas! so beautiful... you are so talented!